Gary Drinkard said he was surprised by legislation Alabama Attorney General Luther Strange proposed at a joint meeting of the state House and Senate Judiciary Committees in Montgomery Nov. 1. Strange, with the support of state prosecutors, will ask the legislature to consider a bill to speed up the death penalty appeals process when it convenes in January. According to reports, Strange told the group Alabama’s direct appeals to capital punishment convictions should run concurrently with Rule 32 appeals rather than consecutively, ensuring justice was served in a “timely manner.” As a former inmate on Alabama’s death row, Drinkard has a rarely-seen perspective on why those appeals matter. As a result of his direct appeals in 2000, the Alabama Supreme Court ordered a new trial for Drinkard because of prosecutorial misconduct. He was acquitted the following year. “It wouldn’t have affected my case, but when you try to shorten the appeals process, you’re cutting out the prospect of an innocent man being able to bring forward evidence,” he said. Drinkard cited the case of Bo Cochran, a black man who spent 21 years on Alabama’s death row before being exonerated for the murder of a white store clerk in Jefferson County in 1976. Today, Drinkard travels the country on behalf of Witness to Innocence, speaking to groups like the one in Mobile last week. He was unable to find steady work after his exoneration because the conviction remained on his record. He has never been offered an apology or any form of compensation from the state for the time he was incarcerated, he said. 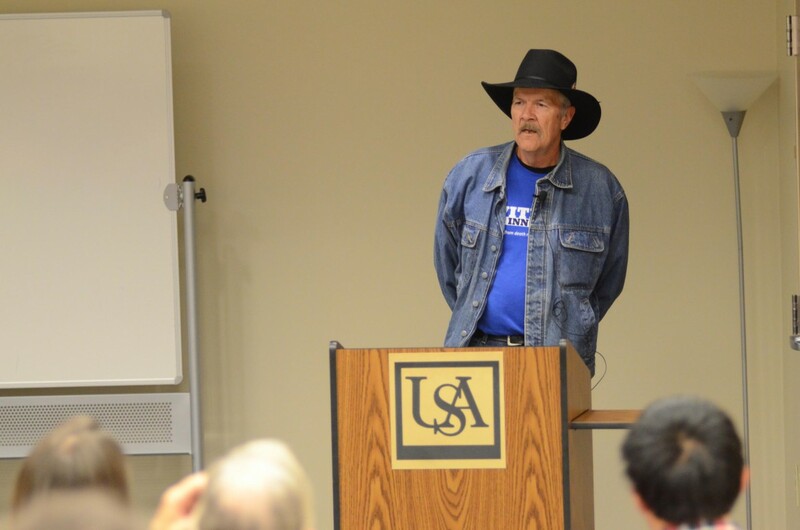 Gary Drinkard speaks about his eight years on Alabama’s death row during an appearance at the University of South Alabama Nov. 7. Legislation proposed by Alabama Attorney General Luther Strange aims to “streamline” the death penalty appeals process in Alabama, where six condemned men have been exonerated in the past 20 years. Drinkard is among a group of citizens who are not only trying to push back against the new legislation, but are also trying to have the death penalty abolished in Alabama. 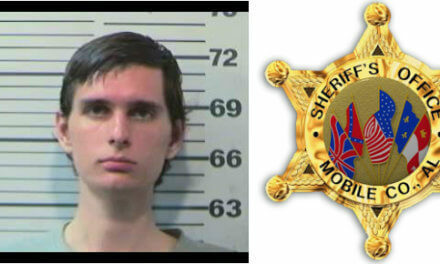 In Mobile County, two death row inmates, William Ziegler and George Martin, have recently been awarded new trials through the appeals process. Both have been incarcerated since 2000. Six death row inmates have been exonerated in Alabama in the past 20 years, while 46 have been executed, according to the Death Penalty Information Center. Alabama currently has 190 inmates on death row. Esther Brown, an organizer for the group Project Hope Against the Death Penalty in Alabama (PHADP), said if there is doubt about any one case, it is one too many. Brown and her group have worked with State Sen. Hank Sanders (D) to introduce annual bills to the legislature to abolish the death penalty, provide a moratorium or other restrictions, such as authoring a bill to ban executions of juveniles or the mentally retarded. In three years, none of their bills have left committee. Sam Sullins of Huntsville, a PHADP member in Huntsville, said he became an advocate against the death penalty after participating in a justice group at church. Since, he has been writing weekly letters of opposition to State Sen. Cam Ward (R). Drinkard said there are other issues that are being ignored, such as whether there should be minimum qualifications for attorneys representing clients in capital cases or whether prosecutors should be elected positions. Prosecutorial misconduct was cited in Drinkard’s exoneration and was also among the reasons a judge ruled in favor of a new trial for William Ziegler last year.